You are here: Home / >THERMOMETER: A MUST-HAVE! It was past 9 in the evening when I heard a light knock on our door. It was our neighbor asking to borrow my thermometer because her daughter’s running a fever. I was shocked that she didn’t have one. Her daughter is a few months older than P and it’s a Mommy must have to own a thermometer. Turns out her daughter have been having fever since Sunday (today’s Tuesday, PH time) and she’s been giving Tempra because she felt her daughter was hot. 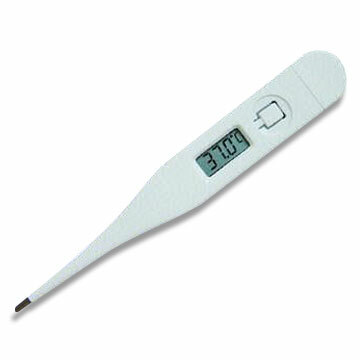 I told her I don’t give P Tempra unless her temp’s above 37.8. Last time P had her fever it was because of some virus she got from someone else (as per her Pediatrician). It’s the kind of fever where your child gets high grade fever without accompanying symptoms such as cough, colds, tenderness and swelling. And when you give her Paracetamol, the fever subsides.